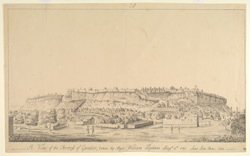 Wash drawing of the fortress of Gwalior by John Hicks (d. 1781), 4 August 1780. Inscribed on the front in ink is: 'A View of the Fortress of Gwalior, taken by Major William Popham. August 4th, 1780. Lieut John Hicks; delin.' John Hicks served in the Bengal Army from 1771 to 1781. The hill fort at Gwalior stands in an imposing position on a long, narrow outcrop of sandstone which rises 300 feet above the surrounding countryside. Local legend asserts that the fort was erected by the Rajput chieftain Suraj Sen who was cured of his leprosy by an ascetic called Gwalior. The magnificent outer walls are two miles in length and 35 feet high encompassing six palaces, three temples, and several water tanks. The fort, which had the reputation of being one of the most formidable in India, inspired the Mughal emperor Babur is to describe it as ‘the pearl amongst the fortresses of Hind’. It lies in the modern-day state of Madhya Pradesh.